Well after 6+ months of hard work, the renovations on our new home are nearly done. I just need to finish up some work in the yard and in the new kitchen and we'll be done. After that I hope to return to more regular blogging - so look for that in the near future! I'm thinking to bring back the random Pittsburgh Pirates card of the day and maybe expand it to just random baseball card of the day. What should I do? Who knows. Let's go Pens. Let's go Steelers. It's Official - 17 years of losing. Let's go Bucs! Oh Pirates, where shall I begin? Not too long ago, my Pirates traded away Nate McClouth - not a popular move in Pittsburgh. There was much angst and many cries of "Here we go again". I chose to believe that management does indeed have a plan and that they are simply trying to stock up on as many good players as possible, even if those players may not make the team for a couple of years -- if at all. The other thing I tried to remember is that while McClouth was a very good player on a pretty bad team, he's just an above average ballplayer on a good team. And while Atlanta has certainly faced their share of troubles this year, Nate wouldn't have to come into that clubhouse and be the savior of the team. There's not too much pressure on him -- kind of like a reverse Adam LaRoche. Then they recently traded away Nyjer Morgan, a speedy and effective leadoff hitter. The big knock against him is that he is just now breaking into the big leagues, at age 28. In exchange for him we received Lastings Milledge and Joel Hanrahan (I think that's his name, I didn't bother to look it up). It seems to me that this management team is willing to swing for the fences and hope that a deal works out. I have to say, I think it's a good idea. With this team, you have to be willing to take a few chances if you want to compete and want to win. If Lastings can get his head on straight, he can have a huge impact on the performance of this team. And the silver lining of all of this is that Andrew McCutcheon now gets to come up to the big leagues and play every day. And boy howdy, has he ever stepped up! Anyway...all of this to say -- there is hope for the Pirates yet. If I'm the last one rooting for them ever, I'll still root for them. My wife and I bought a new house and I've been crazy busy lately - but I haven't forgotten the blog or the cards I need to get out. I'll resume regular posting in the near future. Wow! It's the third Random Pittsburgh Pirates Card of the Day post this week! You guys are so lucky! Today we're looking at a 1995 Flair Denny Neagle card. Now, I have to say - Flair was one of my favorite sets. I remember when I first saw it, I was really impressed. I thought it was so cool. The cards were printed on extra thick, heavy stock. The photography was good and the design was really nice. The cards just looked very classy, if you can say that about a baseball card. Denny's 1995 Flair card is no exception. I'm not sure if it comes across in the scan, but these cards are great. The action shot of Neagle probably isn't the best one, but oh well. It kind of looks like he's in pain. It's tough being a major league pitcher. Denny didn't last too long with the Pirates. He was dealt to the Braves, I think. I'd look it up, but it's not that important. What is important is that you all remember how nice the Flair sets were and go pull yours out of storage and admire them anew. Just try to ignore the fact that the different years kind of look the same. Time to rip open another pack of 2008 Goudey. I said it before, I'll say it again. I like the set, it's just not stunning. It's a nice looking set with a simple, clean design and decent artwork. 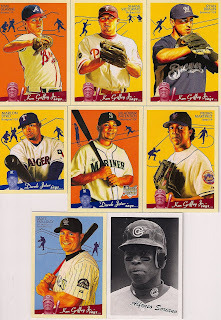 The little Griffey and Jeter blips at the bottom are starting to annoy me, but beyond that it's a decent set. I don't know that I'll try to complete the set. I guess it's not a terribly large set so it wouldn't be too difficult, but I'm just not completely sold on it yet. We shall see. This pack kind of makes me go "eh." Nice looking cards though. This one features Lance Parrish. He had an OK major league career. Nothing spectacular, but nothing to scoff at, either. At this point in his career, he didn't have much power left, although the back of this card does show 320 major league home runs - not terrible at all. I feel like maybe I'm not respecting Lance Parrish and his awesomeness enough, but I just can't get over the absolute ugliness of this Fleer set. 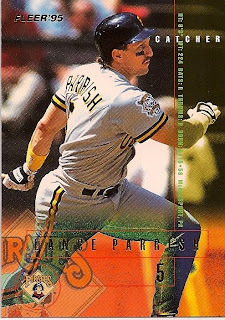 One positive: Lance Parrish is rocking a solid 'stache.